Very nice watch for the money. Very pretty. The face is much bigget than I expected. This charming ladies timepiece from Akribos XXIV showcases an embossed layered dial with genuine diamond accents and crystals along the bezel. The ceramic bangle helps bring the look together for something that is sure to catch the eye. This watch was a fantastic buy! It is beautiful and the white ceramic bracelet has a nice weight and heft to it. It sparkles and looks very classy with either summer clothes or a dressier look for work or evening. I am happy to have it! This small watch certainly packs a big punch! The stones look like real diamonds. Very classy, much a conversation piece. Love it. Very lovely watch. I am glad That I brought it. Liked the watch. It has numbers that I can see. "Hi, Can you please tell me if the face is larger than regular watches? It is for an elderly person, whose vision is not the best. 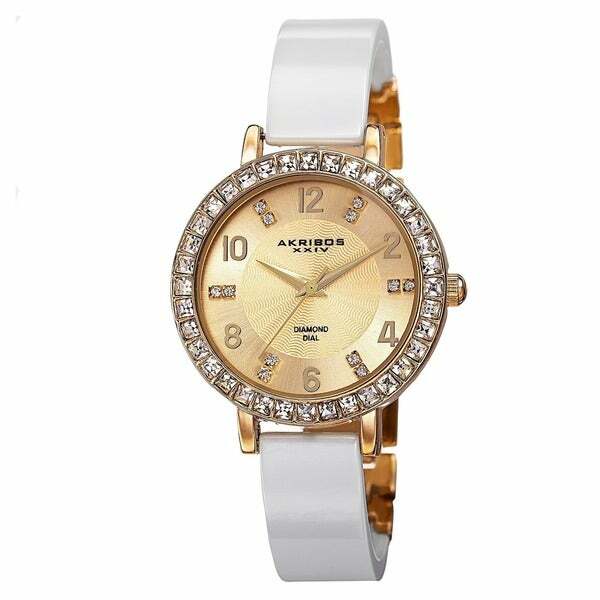 Thank you for confirm, *"
Hello Carole A., women's watches typically have a case width of less than 34 mm. This watch has a width of 32 mm. The numbers on the face are on the larger side, so they should be fairly easy to read. Please let us know if you have additional questions. Thanks for shopping with us.